I spend a lot of time on my feet in a day, so it's really important to me to keep them in good shape, not only for appearance sake but also for comfort. They tend to have some dry skin because I use bleach in my laundry for my white socks, even though I use lotion on them daily they still get dried out. That's not my biggest concern though. Right in the ball of my left foot I have a callus, more scar tissue than a callus I suppose, from stepping on a nail when I was young. I have to keep it filed smooth or it feels like I have a small rock in my shoe with every step. Needless to say I have tried many different foot files and other such torture devices in an attempt to be able to walk painlessly but to no real avail until now. 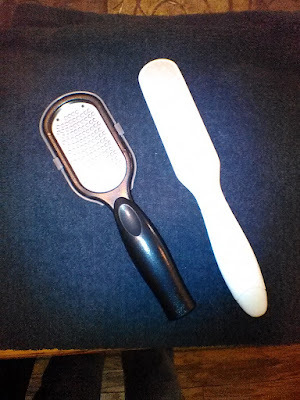 I tried this 2 Piece Professional Foot File Set .To be honest, I had high hopes but wasn't actually expecting more than I had gotten trying the other foot files in the past. To my delight it really works! My feet are smooth and the scar tissue/callus is smooth now too and it doesn't hurt when I walk! YAY! 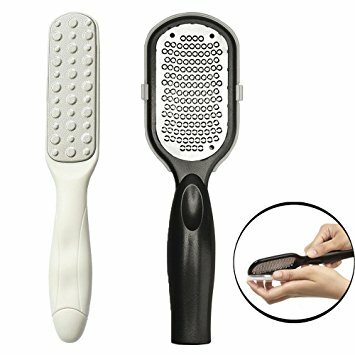 The handles of these files fit very comfortably in my hand and the blades of the rasp are perfectly sharp enough to remove calluses but are gentle on your skin. I really like that the rasp has a cover one the side opposite the blades to catch any of the skin debris, and it's easily removed and cleaned. The file has 2 sides , one that's rough and one that's smoother. Now I can get salon pedicure results in the privacy of my own home and at no expense after buying this set. You can use this set wet or dry, but there's no need to pre-soak your feet . This is a perfect pamper me gift of a great gift for anyone you care about.